“Spring Forward” With Our Daylight Saving Health Tips! Springing forward can be rough on our health – read how to make a smooth transition with our daylight saving tips. First things first – go circle Sunday, March 12th on your calendar – we’ll wait. 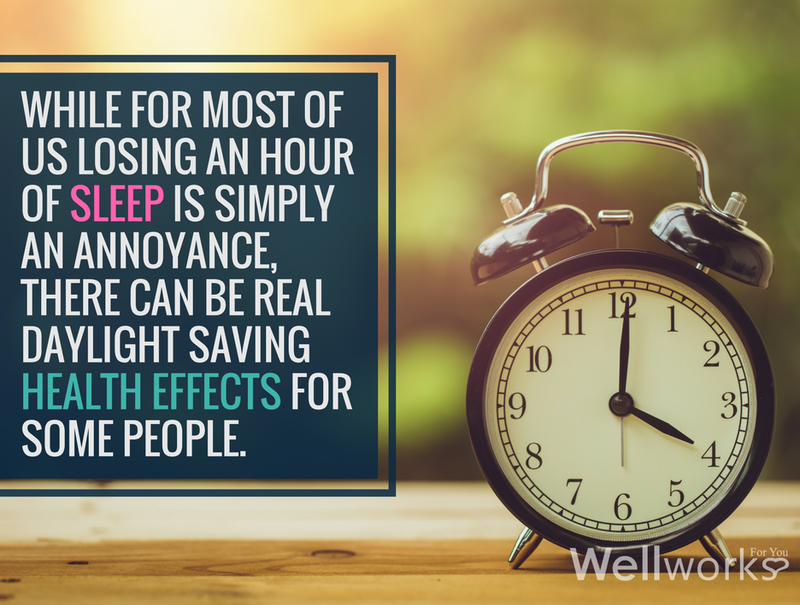 Dr. Holly Phillips states that any daylight saving health effects come down to two things – stress and sleep deprivation. “When we are sleep deprived or stressed, there are more inflammatory markers in our bloodstream, and that inflammation raises our risk of heart attacks,” she explains. While being tired and stressed is detrimental to our health any time of year, the effects can become compounded by the time change. So what can we do to combat the effects of daylight saving time on the body? Take it easy on daylight saving weekend. Go to bed a little early, and feel free to nap on Sunday – but “no longer than 20 minutes” warns The Better Sleep Council. Getting up at your normal time will help your body adjust – regardless of what time the sun rises. Be extra aware on the roads – 100,000 auto accidents are caused by driver fatigue each year, and sleep deprivation due to the time change leads to an increase in crashes. Get some exercise! Working out during the day can help you sleep better, as long as it’s not within two hours of bedtime. Take time to wind down before bed. Put down your smartphone and read a book, sip a cup of tea, or soak in a relaxing bath. A few drops of lavender can help you destress completely. Make your bedroom a sanctuary of calm. Create the perfect environment for sleep by keeping the room dark, quiet, and calm – no TV in the bedroom! These daylight saving health tips are good advice any time of year, try making them a regular part of your commitment to wellness! If you wish you could just skip all this clock-changing hassle – you’re not alone. A 2014 poll found that only 33% of American adults think that observing daylight saving time is worth the trouble. In fact, people are so tired of losing an hour of sleep, that there are dozens of online petitions to abolish the practice on Change.org. For the time being, there’s not much we can do about it aside from taking these steps to adjust to daylight saving time as smoothly as possible. For more information on making better sleep a part of your healthy lifestyle, contact us today!